THIS photo truly brought me joy. Happy Easter to all of you! Please see the attached photo -- this is Margie now. 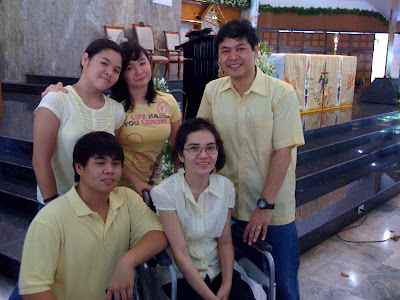 The picture was taken last Easter Sunday, after Holy Mass attended by members of both our families. We celebrated over lunch at home afterwards. Dr. Macalintal was visibly elated by her recovery when we came for a follow-up check today. But Dr. Gozum, Margie's rehab doctor, wasn't as happy. She's ordering more workouts as Margie's legs and left arm are way below expectations. And this is why I write again, to ask for more of your prayers; more of the same prayers that got her this far. Also, we have agreed to Ms. Karen Davila to feature our family in her show Wonder Mom which will air this Saturday at 9:45 a.m. Ms. Davila had wanted to do an inspirational story and we agreed that if that is the intention, then our story is not just ours to keep. SO on their family's behalf, may I again seek your help in praying for Margie? God bless.